3Gstore is now selling the updated version of the IP Switch (above) - same functionality, new look! Our 3Gstore IP Switch review covered the basic features of the device, but it only gave you a brief overview of the device's more advanced features. For our more tech-savvy audience, we have created this review especially for you, to get a closer look at how the 3Gstore IP Switch can benefit you! As you can see, the 3Gstore IP Switch allows you to specify a name for each outlet. This can be extremely helpful if you want to reset a device remotely - with a specified name, you won't have to guess which device is connected to which port, and accidentally reset the wrong device. Another noteworthy feature with regards to the outlet setup is that you can set a delay between the time that Outlet #1 & Outlet #2 start up. This is very useful if you want to have your router boot up first, and then have your DSL/Cable modem power up once the router has had a chance to turn on completely. Power scheduling allows you create custom power schedules for the specific devices that are connected to the 3Gstore IP Switch. You can set up a timer for a specific date & time, a specific day every week, or every day. 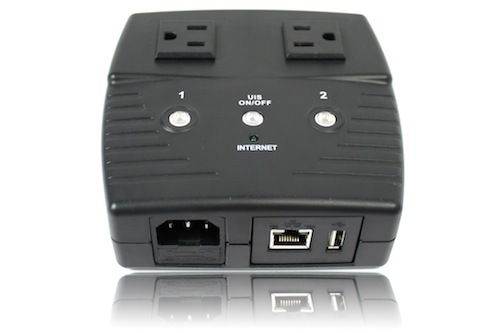 Keep in mind that you can connect a power-strip to each outlet on the 3Gstore IP Switch if need to setup the same schedule for more than two devices. With power scheduling you can have any of your devices automatically turn on at 9:00 am right when you get to the office, and automatically turn off at 5:00 when you leave the office. You could also set a power schedule for your TV so that it can only be turned on from 7-9 pm, or you could simply use it to turn the coffee maker on at 6, and have it turn off at 6:30. The possibilities are endless with power scheduling! With remote administration, you can access the administration page from any computer with internet access, so you don't have to be connected to your local network. This gives you the ability to check on the status of your IP Switch, check log files, change any settings, or even reset power to any of the devices manually. So if you had a device connected to the IP Switch, and it wasn't responding, you could manually reboot the device if you needed. This can be very useful as some devices such as IP Cameras stop responding even though they are still connected to the internet, and the problem can be fixed by simply resetting the device. This feature alone can save you a lot of time, as you can check on the status of your devices or your clients devices and reboot them if needed without needing to be at the same location as the device! To make remote administration even easier to access, the 3Gstore IP Switch has support for Dynamic DNS services provided by DynDNS.com. This allows you to create a free and easy to remember domain to access the 3Gstore IP Switch administration page remotely over the internet. To set this up, your router doesn't even have to have DynDNS features, it simply needs to have port forwarding to forward the proper HTTP port to the IP Switch. You can also change the HTTP port if your ISP will not allow you to use port 80. Another unique feature of the 3Gstore IP Switch is that you can access it via MSN Messenger. As you can see in the picture above, with MSN Messenger installed on your computer or mobile device, you can check the status, get the current public and local IPs of the device, and turn power off/on, or reset power to any devices that are connected to it. This feature makes it very easy for users to check the status or reset devices remotely from their mobile phones that have the MSN Messenger installed on it. It can also be an alternative way to access the device remotely if you are unable to setup port forwarding on your router if your ISP prevents this. Note: AIM & Yahoo Instant messenger support will be available soon via future firmware update! If you are currently using a Cradlepoint router with failover enabled, you especially will benefit from using a 3Gstore IP Switch for increased up time. With the proper settings, you can enable your 3Gstore IP Switch to only reboot your router & WAN device if both WAN & EVDO connections are lost. This means if your primary [ethernet] WAN connection drops, your Cradlepoint router will switch to EVDO backup. The 3Gstore IP Switch won't reboot your network equipment unless the backup connection fails too, this gives your Cradlepoint router time to failback to the primary [ethernet] WAN connection without risking any downtime.